I found writing this last blog for my internship last semester one of the hardest projects I have been assigned. It was so difficult because I am not saying goodbye. In fact, I am saying “hello” and to a whole new experience! As some of you reading this may know, I have been asked to stay on as a content developer for Local Llano AND to begin an apprenticeship under another Ogallala Commons initiative, Stewarding Our Aquifer. Keep an eye out for my next blog about the new challenges, opportunities and projects I will be working on throughout 2016. But for now, let’s take a step back and review 2015. 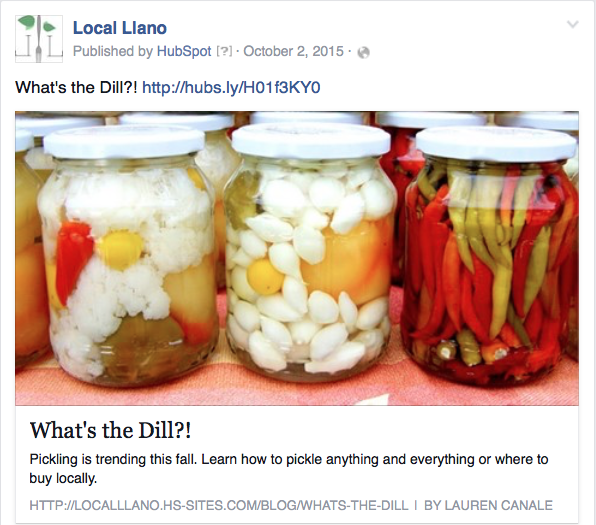 Screenshot of my first blog on Local Llano’s site. Pictured above is my very first publication to Local Llano. In this piece, I detail everything novice picklers need to know about pickling their first produce. I thought of this idea after visiting a few of the farmers markets in late September, most of the produce still available from the summer harvest would be perfect pickling ingredients. It was fun interviewing producers and researching this topic. Before writing this blog, I could only tell you that you can find pickles at the supermarket. Now, I can tell which producers pickle in late summer and where their produce is bought (hint: it’s always from other local producers at the farmers market or from their very own gardens). My first interview with a local producer from the Llano Estacado. Thank you, Woody Williams! Pictured above is my first interview for the Local Producer Series, a series Local Llano started as I was hired on to help create content and copy for the initiative. And what an interview to start on! Smiling Coyote Farms sells seasonings for all sorts of occasions as well as tea blends. Woody Williams, Smiling Coyote Farms’ owner, is just about the friendliest person you could ever meet. His brand, Smiling Coyote Farms, was already well established and known around the Llano Estacado so I thought this would be a great producer to begin the series with. My very first DIY blog and one of my favorite pieces that I have ever written! In the true tradition of saving the best for last, this is my favorite blog from 2015! 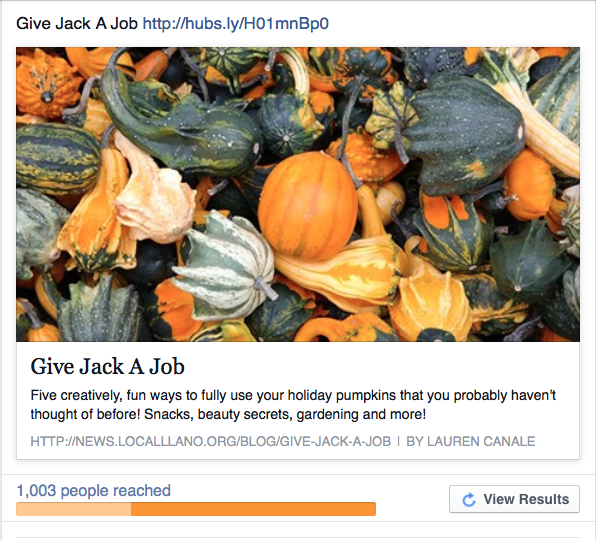 Give Jack a Job is a piece written about what to do with your leftover pumpkin after Halloween is over. It was such a simple piece, written a little hastily (I might have almost missed the deadline). 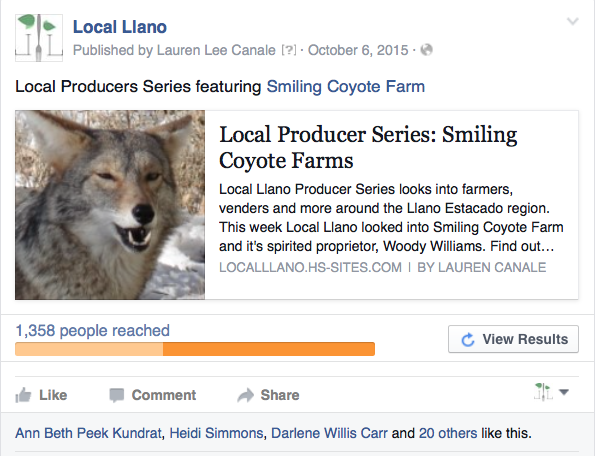 This piece had some of the best feedback from avid readers and resonated will with what Local Llano is as a brand. I still refer back to this piece when I have writers block or just need a little inspiration. I hope you liked reading about my internship for fall of 2015 as much as I loved being a part of this experience. Keep tuning in for updates from this semester’s internships!